Left to right: Ms. Rossana Feliz and Ms. Dayana Pérez, FNU Students; Ms. Mikki Thompson, Director of Pulmonary Services, South Miami Hospital; Jose Antonio Lammoglia FNU Respiratory Therapy Department Head; Ms. Aracelis Barona, FNU Student. 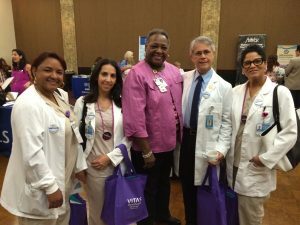 Florida National University (FNU) Respiratory Therapy Students recently attended the Lung Force Expo held in the Signature Grand in Davie, Florida. FNU students and their professor were invited to attend the event at the request of Ms. Mikki Thompson, Director of Pulmonary Services at South Miami Hospital and Mr. Andrew Cuddihy, Director Health Promotions for the American Lung Association.